First samples have arrived from China, horray! We take our new treasures to the WamBam sandbox, which is actually just a piece of land down the street that we have rented from John, an 80 year-old businessman. We haggled with John to let us use a sliver of his land for grass roots quality control. 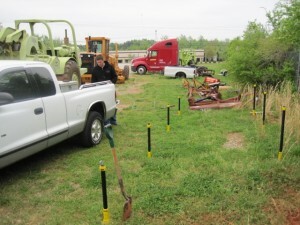 We show up to work in grubs, load up the pickup truck, and start WamBaming pipes into the ground. I want to try out the product myself, and despite my disciplined gym routine, it’s clear I need to pump more iron if I want to drive the anchors into the ground as quickly as Steve. It must be painful for him to watch because after a while, he says, “Give me that thing” as he starts WamBaming the anchors into the ground– quite effortlessly, I might add. And within seconds we’re standing in a rapidly growing puddle. And it’s only getting bigger. We’re really hoping that he hit an oil well, Beverly Hillbillies style. Visions of instant retirement with a lifetime of luxury without all the hard work of an endeavor like WamBam start flashing through my head. But then we realize with dismay that it’s water. Water is gushing everywhere and we have to find John to confess our misdeeds. Things need to happen to rectify the situation: Turn off the water to the property. Dig up the ground to get to the pipe. Call a plumber. Write him a check. A couple hours later, it’s all fixed. I will say that I am impressed with our fence system. Sure, the anchors require some muscle to go into the ground. But it was pretty cool to see in practice, and the posts looked as even and white as a used car salesman’s smile. Yup, maybe I’m biased, but our digless vinyl fence system is pretty cool, innovative, and fun to install. Just as long as the water lines are kept intact. 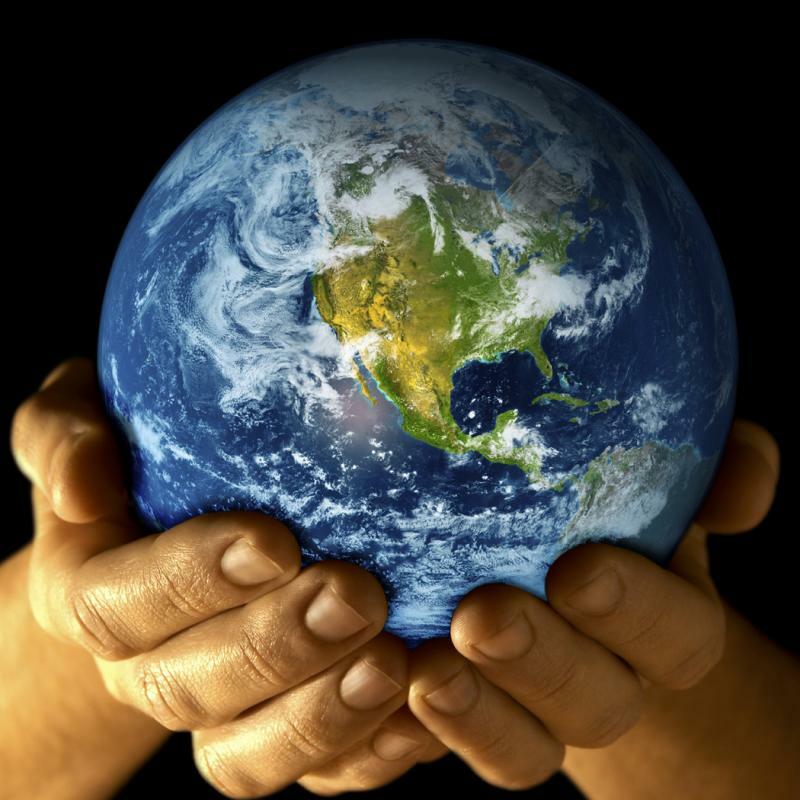 Right now I’m now working on at least a dozen projects with people from the following countries: Macedonia, India, Ukraine, Russia, China, California USA, Georgia USA, North Carolina USA, and Canada. They don’t know each other and they are all working independently of each other. Yes, time zone and language barrier issues occasionally arise. Yes, it’s a lot to manage sometimes. And of course there are problems. But it’s a very cool way to do business and I’m thrilled with the results so far. I love technology. Sometimes the rapid pace of the world scares me, but I want to embrace it. And right now I’m happy to report that it’s working for me. How can I relate this back to fence that’s fun to install? Um, let’s see…well, it’s good to embrace new ways of doing things. 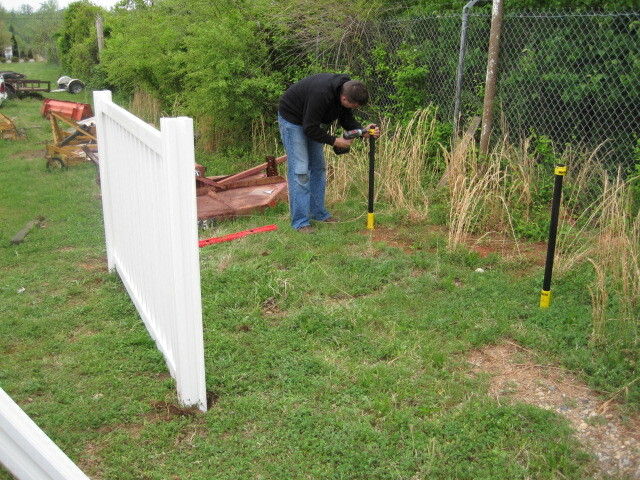 And the new WamBam way of installing fence is very cool, fun, easy, and overall a much better way for a do-it-yourself person to install fence. Ok, that was a stretch. Sorry. But it’s all I got.